The 20nm process technology has been in the talks for quite some while, we have all seen how NVIDIA and AMD were rumored to get it for their latest graphics cards but the reality is that the current generation of graphics processing units will stick to the current 28nm process technology. As for custom chips and CPUs, AMD revealed during the reveal of their Project Skybridge initiative that they have plans to bring 20nm SOCs marketed in early 2015 however a report by Kitguru reveals that AMD might not be able to launch any 20nm parts till second half of 2015. 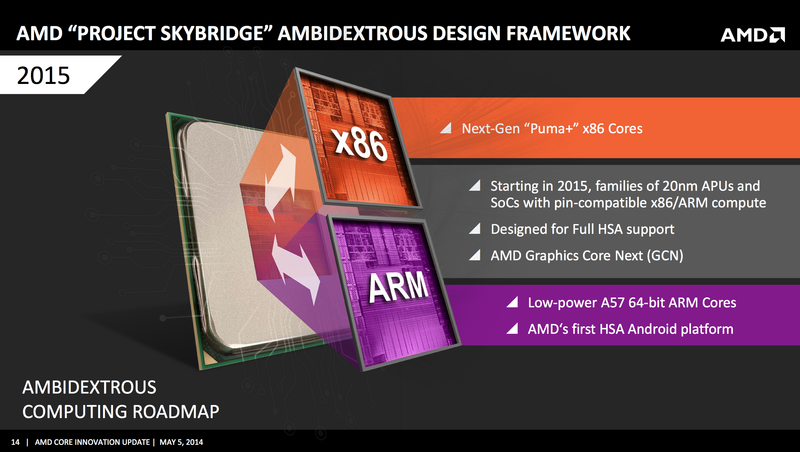 In 2015, AMD has a handful of chips to launch which includes their Godavari APU family powering the desktop side, Carrizo / Carrizo-L APU family powering the notebook side. While Nolan was meant to be a replacement for Mullins and Beema APUs, it was re purposed as another 28nm chip which will serve AMD’s notebook line of APUs under the Carrizo-L name. A proper replacement for the low power Mullins platform may also be planned on 28nm node but it is yet to be detailed by AMD and will most likely feature low-power Puma cores. The thing about this entire lineup is that it is based off a 28nm process technology while Intel shifts to 14nm across their entire product stack in 2015 with Broadwell and soon to be released Skylake generation of processors. AMD has a few custom APUs and SOCs being designed which will be part of their Amur family of chips that will be available in both x86 and ARM flavors. Nolan and Amur is AMD’s special platform – an attempt to break into the low power mobility market and compete against Intel’s Cherry Trail. These pin-to-pin compatible “Skybridge” chips will be using the 20nm process technology from TSMC but as detailed, during filing in with Security and Exchange Commission, AMD revealed that they have not yet started using the 20nm process technology which implies that a delay for the chips may be in bound and the launch may possibly shift to 2H of 2015 or even late 2015. According to Kitguru, while production of new chips begins months prior to introduction, AMD has not yet initiated production of their latest 20nm chips. Currently, the major chips utilizing TSMC’s 20nm process node are the A9 from Apple, Snarpdragon 810 from Qualcomm and Tegra X1 from NVIDIA. AMD will be hopping abroad this bandwagon in second half of 2015 if their plans go well. The new SOCs and APUs will be aimed toward Android Platform which will be able to support HSA (Heterogeneous System Architecture) and feature GCN (Graphics Core Next) architecture to leverage graphics performance on android platforms.